The St. Louis de Montfort Academy attended a historical event in our diocese. 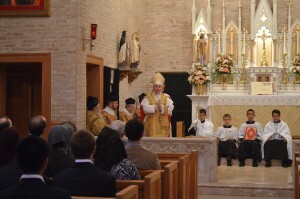 The Bishop of Harrisburg, the Most Reverend Ronald W. Gainer, celebrated a Solemn Pontifical High Mass (Latin Mass) at the Carmel of Jesus, Mary, and Joseph in Elysburg, Pennsylvania, on October, 15, 2014. 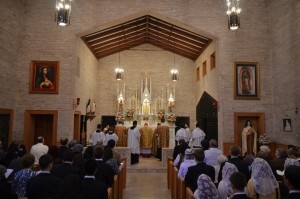 This Mass was celebrated in honor of the feast of St. Teresa of Avila, foundress of the Discalced Carmelites. It was the first time since the liturgical changes of the seventies that a bishop of Harrisburg has celebrated this form of the liturgy in this diocese. Before the Mass began, the sacred ceremony of the vesting of His Excellency took place. At the beginning of this ritual, Bishop Gainer was vested while sitting beside the deacons. Also, while being vested, the bishop was reciting prayers that would help him celebrate the Mass with devotion and reverence. After this initial ceremony, His Excellency processed out of the sacristy with an entourage of priests, deacons, and altar servers. During Mass, the subdeacon chanted the Epistle while Bishop Gainer sat in his majestic throne. Following this, the deacon chanted the Gospel as the bishop rose, holding his beautiful crosier. Bishop Gainer then gave a resounding sermon about St. Teresa of Avila. At the Offertory the bishop, assisted by the deacons, offered the bread and wine to the Heavenly Father. At the most sublime moment of the Mass, His Excellency with venerable and spotless hands consecrated the bread and wine into the Body and Blood of Christ. In conclusion of this magnificent Mass, the Salve Regina was sung while Bishop Gainer and his retinue of priests, deacons, and altar servers processed out of the chapel. 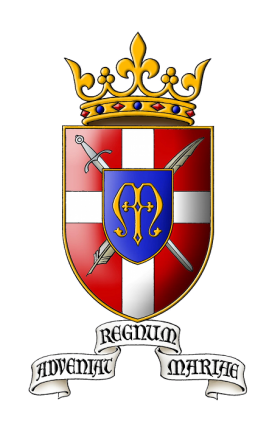 It is evident that this is a true honor for the St. Louis de Montfort Academy to attend such a historic and Catholic event in the diocese of Harrisburg.